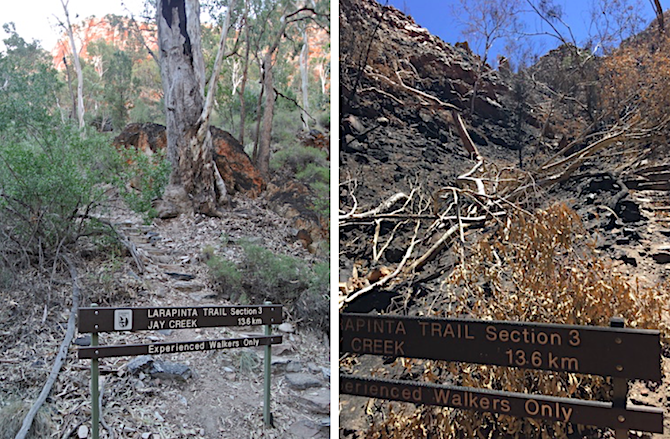 The Staircase to Heaven, the beginning of Section 3 of the Larapinta Trail, starting from the track between the Standley Chasm restaurant and the chasm, before (at left) and after the fire (at right). 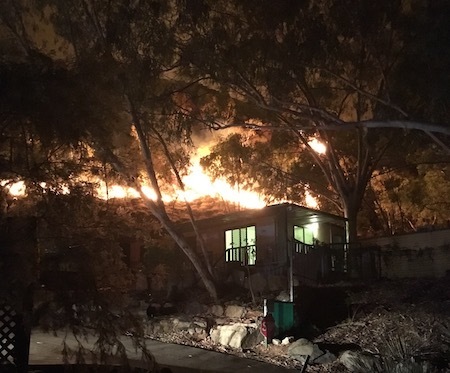 “An inch of rain and we’ll be right again,” said a man in Ormiston Gorge on Sunday where people had been evacuated and assets such as the kiosk complex and the ranger’s station were saved from the firestorm last month at the last moment. At right: The fire was within meters of the Standley Chasm restaurant. Only days after the emergency new manager Nova Pomare, a member of the big local McCormack family, had the place up and running again and was ready for 50 breakfast guests on Sunday morning, February 3. She took this photo. Fiona Walsh, who’s lived and worked in The Centre as a desert ecologist for 25 years, has a more concerned take on the disaster. She sees it more as a battlefield honour roll – Standley Chasm, Hugh River, Serpentine, Ochre Pits, Ellery Creek, Ormiston, Redbank, Mt Sonder (on the horizon, below) – they all suffered to varying degrees. She sees them equally as places to study and learn and places to live a good life amongst nature. 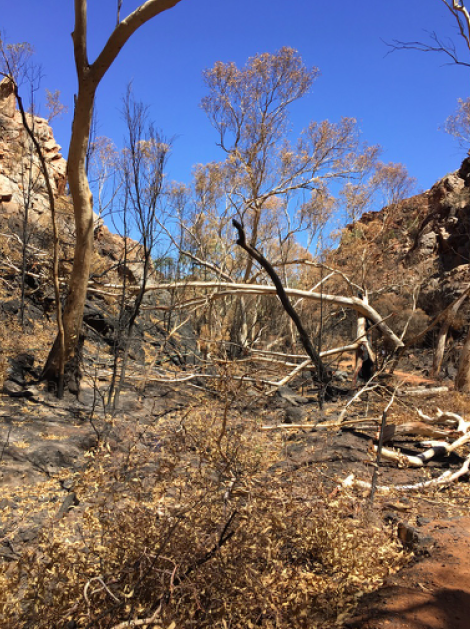 The results of the 17 day, out-of-control inferno are only partially known and are certain to include irreversible losses in this major playground close to Alice, for locals and tourists alike, a key factor in the local economy. The government continues to withhold information about essential precautionary burning during last year’s winter, and about the budget for it, mandated in the national park’s management plan. Dr Walsh says what we do know is that this was the third major blaze in 20 years. “About half the park burned in 2001. There was another series of fires in 2010, and now we had these extensive, hot, wind driven fires” covering 1200 square kilometres, according to Bushfires NT. “The consequences are the ground being razed of vegetation cover on the slopes, up the ridges and along the crests, severely damaging gullies and valleys that hold big long-lived river redgums, ironwoods, beefwoods and other trees,” says Dr Walsh after a two-day trip through the park. “Very hard timber species like ironwoods have fallen and just become ash beds. 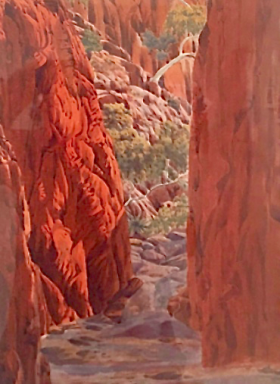 An icon of The Centre, Standley Chasm by Albert Namatjira. The scars of the fire stop at the entrance. “The signature of those trees has disappeared. For me that’s quite a painful thing. The marker of a being existing has just been annihilated – irrevocably. “With the loss of vegetation cover there are exposed slopes that look very hot, possible the radiant heat levels are higher, which makes it very difficult for animals, plants, people to re-establish, for people to walk. “Should there be rain, at best we want it to be soft and gentle, not inches of deluge because that will run the risk of causing, without the vegetation cover, soil and the fine ashes to slip down into those precious jewels of water bodies. “The Macs have a diversity of water bodies ranging from the beloved Ellery Bighole to the really subtle, small seepages. Across this spectrum are plant species that are small, tiny relicts that are rare species, and then there are also places where there are snails that have diversified, so that they are unique. “We are losing biological diversity and species richness – the number species and the number in each of those species. “While there is some documentation of what the flora of the West Macs is, there is a lot that is not known. “I don’t think we can say. It is totally dependent on weather conditions. We are having a less reliable and regular rainfall pattern. At right: Trees became ash beds – lying white on the ground, ghosts. “The rainfall pattern is trending from a mix of cool season – hot season rains to these big downpours in hot season times. They are actually accelerating the risks of erosion. Is there anything that is lost forever? When people drive to Glen Helen they see a lot of unharmed scrub. “When people are driving west from Alice Springs they should have their eyes wide open and see the landscape for what it is – not judging it against Victoria or Queensland, big forests or the density of rain forests. “See the rich places here and use those as the markers of comparison. At left: Although trees on the western bank of the Ellery Creek were on fire, there were lots of visitors at the Bighole on Sunday. That, of course, is where the trekkers on the Larapinta Trail indulge in their passion, uphill and down the MacDonnells’s major mountains. The draft plan of management makes it clear that precautionary burning must be conducted. That suggests this is a reasonable requirement or it wouldn’t be in the plan. “The plan specifies – prescribed burns, strategic firebreaks, patch burning. Lines of breaks to stop or slow a wildfire. Much of the fire damage was on the southern flank of the ranges. Arrows show the line to which the blaze reached. “We saw how effective Namatjira Drive was [as a fire break]. Where there are tracks they could be kept accessible and possibly widened by deliberate burning. “The plan also asks for protective burning not just for the infrastructure, which is critical. “The ranger stations, and the Standley Chasm complex, for example, have to be maintained by prescribed fuel load control, as should the highly valuable plant and animal refuges be protected. “Tragically, Standley was one refugia or oasis that has suffered . 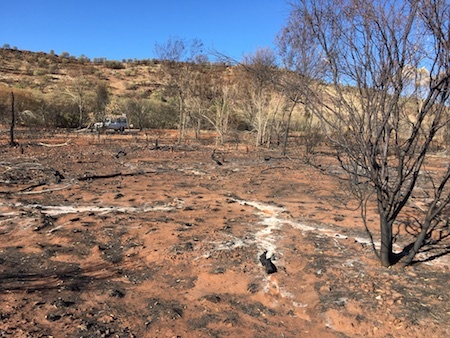 There needs to be patch burning in spinifex country, to break up fuel loads, and opportunistic burning when there is a particularly dense grass or buffel stands. “That should be done diligently, responsive to fuel loads and weather conditions,” says Dr Walsh. “A question is, has Parks been adequately resourced to fulfil those management obligations under the plan. Do they have the skills, the capacity and the confidence needed to implement that sort of burning regime? The “West MacDonnell (Tyurretye) National Park Draft Joint Management Plan 2011” could not be clearer about the need for fire control in the park. The Alice Springs News Online has not had a response from the government to our question whether the “draft” has become the actual plan. 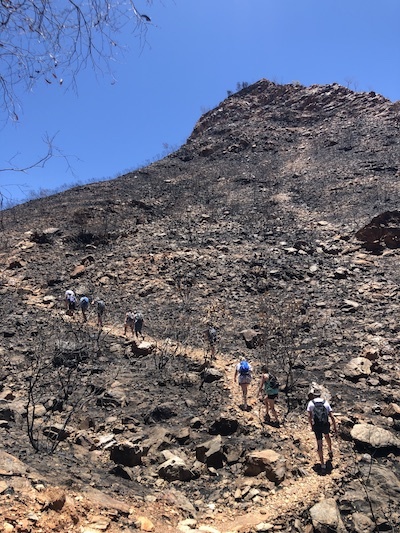 The track to the Ormiston Gorge lookout: The fire burned to within a few meters of the campground, kiosk and ranger’s quarters. “It has been prepared by three planning teams with representatives of the 16 traditional owner estate groups of the park, Central Land Council staff and parks staff, with input from tourism industry representatives, business operators, nearby land managers and the community,” says the introduction. “The management of fire will be given high priority,” says the government document. • Prescribed burns: In most years, the majority of the areas deliberately burnt will be located in fire-tolerant vegetation, particularly Spinifex-dominated communities. • Networks of strategic firebreaks will be created or reinforced through interconnection with natural fire-breaks or other fire breaks. Other fire breaks will be burnt to protect fire-sensitive vegetation and infrastructure. • Low intensity scattered patch burning of ground fuels will be implemented in appropriate vegetation communities. • Infrastructure: Mechanical, chemical and fire control of fuel loads around infrastructure in priority visitor nodes will also be undertaken. • Opportunistic burning: When flushes of annual fuels occur, more burning may be required in non-Spinifex vegetation types. • Fire sensitive habitats will be mapped. Environmental burns to maintain biodiversity will be planned annually using biophysical data. Burns will be conducted over the cooler months or after rain. • Wildfires will be reported to Bushfires NT and action taken to control their spread whenever possible. Assistance will be given to neighbouring landholders to control wildfires that may threaten the Park, and, on request, to reduce fuel loads. Graders and other heavy machinery will be used for wildfire suppression purposes only in extremely threatening circumstances to protect life, assets or key habitats, and will utilise existing tracks as much as possible. • Controlled burning ‘off-Park’: On request, consideration will be given to assisting neighbouring landholders to burn areas outside the Park to reduce fuel loads and minimise the risk of wildfire incursions into the Park. Assistance may also be given to neighbouring landholders or Bushfires NT to control wildfires threatening the Park. • Fire history recording and fire monitoring: Emphasis will be placed on systematically recording fires, maintaining the fire history of the Park and formalising a fire monitoring program. 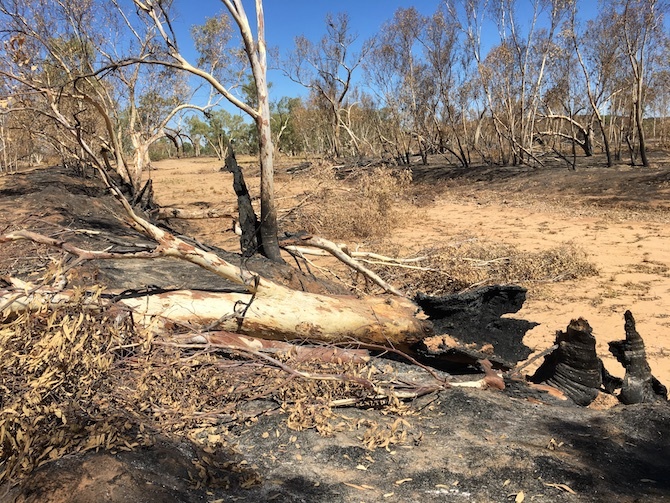 • Parks and Wildlife will work with Bushfires NT and neighbours to develop regional plans that maximise the potential to reduce the impact of large scale wildfires. How much – if any – of this has been done is not something the government is prepared to disclose. The Alice Springs News Online posed the first questions on these issues to the NT Government at 2.38pm on February 5, six days ago – still no answer. 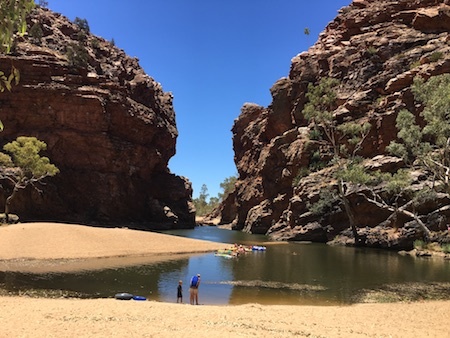 Meanwhile for Dr Walsh the knowledge she gained of the West Macs from her colleagues and work in Central Australia is complemented by “connection and adoration to the region” and now by a profound sadness for what has happened – yet again. “When we toured on the weekend I saw the Hugh River (below). There was where I felt most upset,” she says, “when I looked at the magnificent ancient trees felled. It was like a graveyard. 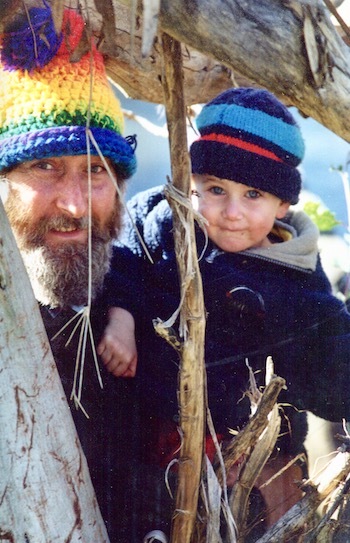 “I have this photo of my son and his father (at right), framed by this wonderful big eucalypt. We’ve camped under these trees, known them individually. They gave shelter to parties and picnics. Trees have helped connect children and families I love, and friends I hold dear. Now so many of these same trees are gone. Above: Hugh River. Below: The creek along which you walk to visit Standley Chasm. The path has been cleared, partly by a team of prisoners. PHOTOS by FIONA WALSH, KIERAN FINNANE and ERWIN CHLANDA.